Residents of the Bulgarian mountain resort town of Bansko have been staging over the weekend protest rallies with demands to have permits to build a new ski lift and to expand the ski tracks. 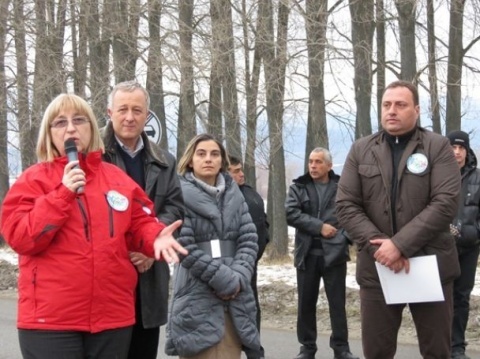 The Speaker of the Parliament, Tsetska Tsacheva, who is vacationing in Bansko, joined the rally in support of the demonstrators, saying she wanted world and European glory for the resort. "The Pirin mountain is to be enjoyed by everyone; this is a gift of nature we must utilize, make it work for us, because dear friends – what is nature without people? People make some region prosperous; they create its unique atmosphere, which is popular beyond Bulgaria. For these reasons, I believe your demands are just, and I will convey the emotions from this peaceful rally to my colleagues in the Parliament and will work on making them a reality," Tsacheva told the protesting Bansko residents. Over 1 000 people, residents and some guests, blocked over the weekend the entrance of the resort with demands for the government to finally decide on the permits. They insist this would not cause any environmental harm because the construction will be done only within the now-existing limits of the ski zone. Such decision will lead to eliminating a text in the plan for management of the Pirin National Natural Park. The Chairman of the Initiative Committee for organizing the protests, Malin Bistrin, pledged that rallies will be held every day, despite the holidays and the peak of the ski season, until the issue is resolved. The Mayor of Bansko, Georgi Ikonomov, who supports the demonstrators, declared he would not negotiate with the Greens party unless OLAF, the EU anti-fraud office, probes how the environmentalists are using resources and spending money. Lyuben Tatarski, Member of the Parliament from the ruling Citizens for European Development of Bulgaria, GERB, party was also present in support of the demands of the demonstrtors, and confirmed that there were no legal hurdles for them to be fulfilled. Tatarski, who in the summer joined similar protests, believes new construction would contribute to the modernization of the ski resort. The rallies have caused long lines of vehicles, outraging some of the guests arriving for the extended holiday weekend, while others have supported the demonstrators.